The system consists of screw conveyor vibrating screen, feeding hopper vane guide, conveying line including insulated drying column and conveying line through which wet or moist material is conveyed with hot air. A powerful low pressure open wheel centrifigal fan assures significant resilience time for removal of excess moistures. Material is conveyed to cyclone and discharged through tap duct. Being a well known organization, we are involved in offering a comprehensive range of Heatless Adsorption Dryer tour customers. These products are sturdy in construction and offer hurdle free performance with accuracy. All these products are technically sound and are highly demanded by our customers. 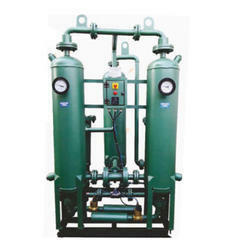 Compressed air is polluted with dirt particles, water, oil, oil vapor and condensate. These contaminants result in high maintenance costs, premature wear, spoiled products and the failure of control systems. DHA Series adsorption dryers will effectively remove these contaminants. Heatless adsorption dryers with pressure dewpoints to -70 °C are suitable when D series refrigerant dryers with pressure dewpoints of 3 to 7 °C will not meet the requirement. 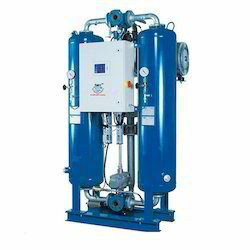 Heatless adsorption dryers are used in certain applications where compressed air moisture can damage the process or products. With the use of activated alumina as the desiccant our heatless dryer can produce up to - 400C pressure dew point and can be raised to -700C by using molecular sieves. Customised / engineered adsorption dryers are designed and produced to the exact specification of the customer.